Who gets the blame for this Cowboys collapse? Plus, all the notable news from Week 15 in the NFL. It’s the sequel that only Packers fans, Eagles fans, and Cowboys masochists could have wanted: Tony Romo Screws Things Up at the End XXVII. Sequels always need to go bigger and badder to top the previous edition, though, and while Romo only threw one pick in Dallas’s heartbreaking loss to Denver in Week 5, he upped the ante by throwing two interceptions in the fourth quarter of Dallas’s stunning loss at home to Green Bay on Sunday afternoon. It’s a loss that leaves Cowboys fans reeling, not only by its nature, but by the fact that the Eagles had lost earlier in the day; a Cowboys win could have put Dallas in the driver’s seat to win the NFC East. Now, the Cowboys will need to win out or spend January on the golf course for the fifth time in six seasons. Even by Cowboys standards, this game was a case of defeat being snatched from the jaws of victory. Dallas had a 23-point lead at halftime; since 1990, teams with a lead between 21 and 24 points at halftime were a combined 277-12 (.958).1 Dallas allowed a touchdown quickly after halftime, but it still had a 96 percent chance of winning the contest with five minutes to go and managed to blow the game so badly that Matt Flynn actually got to take snaps in the victory formation. Oh, did I mention that Matt Flynn — cut by the Raiders and Bills already this year — was the guy who led this comeback? There are three parties that get blamed for every late Cowboys failure, and it’s no different this time around. Let’s review their relative culpability. 1. It’s Tony Romo’s fault. Nobody’s going to enjoy the “Is Tony Romo clutch?” debate, so let’s just skip past that for now. Briefly, though, let’s run a table and talk about the whole “Tony Romo can’t win in December and January” thing. These are Romo’s numbers, split by month, over the course of his career. The win-loss records are his records as a starter and include both Romo’s regular-season and playoff performance. The only game that’s not included in his win-loss record is a December loss to the Eagles when Romo threw two passes before injuring his hand. The problem in believing that there’s something seriously wrong with Romo in December and January isn’t that he plays worse in those months or that the Cowboys don’t win as frequently at the end of the year. He does play a bit worse and they don’t win as frequently. OK. Now that we’ve cleared that up, it’s hard to argue that Romo isn’t at least partly responsible for what happened to the Cowboys on Sunday. Romo ripped the Packers secondary apart during the first half, going 16-of-27 for 250 yards with a touchdown. Things fell apart in the fourth quarter. The Cowboys got three possessions and Romo threw interceptions on two of them, with a third questionably wiped off the board before Romo drove his team down the field for a touchdown. The critical moment that really swung the game was Romo’s first pick that stood, which came with the Packers down 36-31 and 2:58 left in the game. It is the Romo interception that we would put in a time capsule if we wanted future species to know what the Romocoaster was like. The play starts with a moment of sheer, undeniable brilliance from Romo, as he manages to elude unblocked commercial pitchman/occasional football enthusiast Clay Matthews to keep the play alive. Immediately after doing so, though, Romo’s improvisational skills tell him to fire a ball into a window that is no longer open, and when he leaves the throw behind Miles Austin, Sam Shields is able to pick the pass off. It’s a surprise that Romo threw the ball at all; the play was primarily designed to be a run. Jason Garrett alluded to it after the game, and it was misinterpreted afterward in some circles as Romo audibling out of a run play into a pass, but Grantland’s Chris Brown noted in the moment that the play was designed as a packaged play with multiple options. Watch the video again. The Cowboys’ offensive linemen block like it’s a run play. Had Romo even had the time to hand it off to DeMarco Murray, Matthews would have swallowed him whole with the backside pursuit. You’ll also note that every single member of the Packers honors the run-action and heads for the developing point of attack. There’s no safety helping Shields on that play. If Romo leads Austin, there’s nobody standing between Austin and the end zone. Romo read the defense properly and was right to think pass. He did an incredible job of eluding Matthews. The slant that Austin was designed to run as the second option on the packaged play had come and gone by the time Romo escaped Matthews’s clutches, though, and Romo threw it like it was still there. That’s where the mistake came in. Romo’s second interception is mostly on Cole Beasley. I don’t love the decision to throw a two-yard out to the sticks on second-and-1, and I don’t think Romo realized that Tramon Williams wasn’t going to sink any deeper, but Beasley freezes in the middle of his route. That just can’t happen. Beasley took the blame afterward, saying as much. If he completes his route, the pass is either complete or incomplete, but it’s really difficult for the throw to be intercepted. On the first drive of the fourth quarter, before all that went down, Romo also had a pass ruled to be intercepted on the field before being overturned on replay. I actually didn’t think there was enough evidence on replay for that ruling to be reversed. That being said, it came on a Romo pass that hit Jason Witten in the hands. 2. It’s Jason Garrett’s fault. I’m not buying this one. The Garrett argument says the Cowboys were having success running the ball — with Murray averaging seven yards per carry at one point — and so the Cowboys needed to continue to run the ball to kill clock and pick up, presumably, seven yards every time they wanted. It’s a lot more complicated than that. For one, as you can see with the interception on the packaged play, play calling isn’t quite as simple as calling a run play or a pass play these days. Offenses are designed to take advantage of what the defense leaves available, and with the Cowboys having success running the football and the Packers desperately trying to get the ball back down by multiple scores in the second half, what do you think they were setting out to stop? There’s little sense in running the ball for the sake of running the ball if there are eight men in the box and you have Dez Bryant and Witten at receiver. Furthermore, were the Cowboys really better off running the football? In the second half, they had a total of five possessions. Two were the aforementioned short drives that ended in interceptions. The first was a 13-play drive that took 6:30 off the clock with seven passes and five runs, the latter totaling 16 yards. It produced a 50-yard field goal. The second was a three-and-out with two incomplete passes and a sack that lasted 63 seconds. And the third drive lasted 4:43, with two runs for a total of 20 yards. Romo went 6-for-7 for 50 yards, ending with a touchdown pass to Bryant. Clearly, nobody’s criticizing the Cowboys for throwing the ball too much that drive. So, then, are we really going to blame Garrett for not calling a running play on what became a three-and-out with his team up 29-17 and 16 minutes to go? On that drive, an open Murray dropped a high-percentage pass on first down, Romo missed James Hanna on second down, and he took a sack (which did keep the clock moving, coincidentally) on third down. And with that much time left, you’re not trying to burn clock for the sake of burning clock; you’re trying to score. I consider myself an expert in finding things that Garrett has done wrong, and, I’m sorry, this just isn’t registering for me as a primary cause of this loss. 3. It’s the defense’s fault. Romo made a bad throw. Garrett could have called for an extra run play or two. Not unreasonable. What about the guys who allowed an offense run by Matt freaking Flynn to score 34 points in the second half? Green Bay scored on each of its five meaningful possessions in the second half, two of which started with excellent field position: one after a punt return to the Dallas 22-yard line, and the other after Shields’s pick of Romo exactly at midfield. The other three drives all started on the Packers’ 20-yard line. Flynn went 16-of-22 for 182 yards and four touchdowns in the second half. Eddie Lacy carried the ball 13 times for 110 yards, including a 60-yard scamper to start the third quarter. During that second half, Flynn was not sacked once. From what I can tell without coaches tape, he was only knocked down once all half. The defense doesn’t get blamed for stuff like this, though, because there isn’t the one smoking gun. It’s way easier to hang your hat on an interception than it is on a blown coverage or a missed tackle. There’s no individual defensive play that’s as obviously detrimental as an interception. Romo made a bad throw. The defense probably produced about 25 subpar snaps in the second half. That sort of disadvantage is more subtle, but it’s far more impactful. Ask yourself this: When was the last time Romo’s defense bailed him out? I can think of a whole bunch of times when Romo bailed out his defense. Like the two-minute drill against the Vikings a few weeks ago after his defense blew a fourth-quarter lead. Or last year, when Romo led two touchdown drives in the final four minutes to tie up the game against the Saints. Or the 10-point, fourth-quarter comeback against the Bengals two weeks earlier. Where are the games when Dallas’s defense comes up with a big play late to seal — let alone create — a victory?3 You’re not wrong to pin some of the blame on Romo. But, again, if we’re going to talk about what’s going wrong with the Dallas Cowboys, it seems wrong to blame the side that scored 36 points far more than the one that allowed 37. As for Flynn, he might have saved the Packers’ season. This was his second consecutive win with a fourth-quarter comeback, and the Packers needed both those wins to realistically keep their head above water in the NFC playoff hunt. Now, at 7-6-1, the Packers can likely bring Aaron Rodgers back into the fold with something meaningful to play for. They’re hardly favorites to win the NFC North, but they just need the Lions to slip up once to control their own playoff destiny, which is far more than the team could have hoped for when it was trailing in the fourth quarter against the Falcons last week. Everyone let everyone else off the hook. There were a bunch of teams that could have taken real strides toward improving their playoff situation this weekend, and virtually every one of them failed to make the move they wanted. 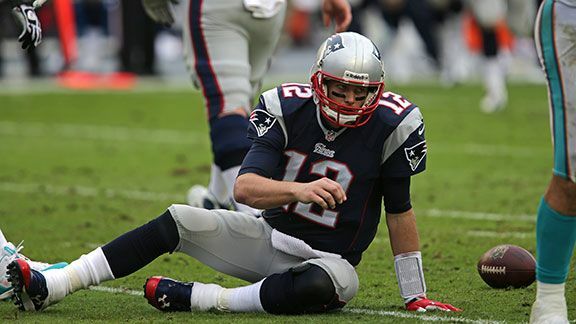 In the AFC, the Patriots’ reign as the top seed in the conference lasted all of two days. Their loss to Miami knocked New England out of the top spot, and it will need the Broncos to slip up again to have another shot at claiming home-field advantage throughout the playoffs. With Denver playing Houston and Oakland over the next two weeks, that seems unlikely. The Patriots could have fallen out of the bye spots altogether with a Bengals win, but Cincinnati slipped up at Pittsburgh on Sunday night, with the Steelers getting out to a 21-0 lead before claiming a comfortable 30-20 victory. The Bengals now are basically out of contention for the top seed in the AFC (barring two Denver losses, a Patriots loss, and a Bengals sweep), and they’ll need to make up a one-game difference on the Patriots with two games to go, equaling them on record and winning the head-to-head tiebreaker. The Colts, who blew out Houston on Sunday, now also have an outside shot at claiming the no. 2 seed. They would need to win out and have both the Bengals and Patriots lose at least once. That would give Indy a better record than the Bengals and the tiebreaker win over the Patriots by virtue of a better conference record. The Colts travel to Kansas City this week before hosting the Jaguars in Week 17. The bottom of the AFC will become clearer after Monday night’s Ravens-Lions game. The Dolphins took a big step forward with their win over New England, which leaves them at 8-6. If Baltimore loses, Miami will be one ahead of the Ravens with two games to go. If Baltimore wins, it’ll be tied with Miami at 8-6, but the Ravens hold the tiebreaker after beating Miami earlier this year. The Chargers need to win out and have both Miami and Baltimore lose out. The Steelers and Jets need too much help to bother caring about. That leaves the Chiefs, who are locked into the no. 5 seed unless the Broncos lose again, in which case a Chiefs win would leave Kansas City atop the AFC as the no. 1 seed. In the NFC, Seattle has all but clinched the top seed and home-field advantage throughout the playoffs. There are three 10-4 teams with theoretical chances of catching 12-2 Seattle, and the Seahawks hold ironclad tiebreaker victories over two of them (New Orleans and Carolina). The 49ers would need Seattle to lose to the Cardinals and Rams at home while they beat Atlanta and Arizona, which would give them a tiebreaker win by virtue of their superior record in the division. That’s not happening. The 49ers still have a lot to play for. If they beat the Falcons next week, they’ll be 11-4 and assured of their standing as the no. 5 seed in the NFC for at least next week, since the loser of the Panthers-Saints game will be 10-5. San Francisco can’t sleepwalk, either; if it loses at least one game and ends up in a tie with that NFC South team, the South team will win the tiebreaker, thanks to Carolina and New Orleans prevailing over the 49ers earlier this year. If New Orleans wins next week, it clinches the division and the no. 2 seed; if Carolina wins, it would improve to 11-4, one game ahead of the Saints with one to go. If the Panthers then lost at Atlanta in Week 17, a Saints win would give them back the NFC South and the no. 2 seed. The winner of the NFC South is guaranteed the no. 2 seed and a first-round bye. The wins by Green Bay and Chicago ramp up the pressure on Detroit, which now basically has to win this game against Baltimore to not be at an enormous disadvantage. If it does, it’ll move back into the divisional lead and hold the fourth spot in the conference, with Philadelphia (which holds a tiebreaker on each of the three NFC North competitors at the moment) in third. If Detroit loses, it’ll be a game behind Chicago and Green Bay. Detroit holds the tiebreaker over Chicago and Green Bay if/when their records are equal. Detroit remains in control of its own playoff destiny: If it wins out, Detroit will win the NFC North. If the Lions slip up against the Ravens, Giants, or Vikings, though, the Bears and Packers will sneak ahead. Chicago still plays Green Bay in Week 17 in a game that will either be incredibly meaningful or just about meaningless. Let’s work backward here. If the Lions lose Monday night, whichever team wins the Bears-Packers game in Week 17 will win the division if it also won its game in Week 16. If the team that wins the Week 17 matchup lost in Week 16, meaning that the Bears and Packers each finish 1-1, the Lions would win the division by winning their final two games of the season. If all three teams finish 1-1, the winner of the Bears-Packers game wins the division. My head hurts, too. One more permutation: If Detroit wins Monday night but loses in Week 16 or Week 17, it would lose the division to the winner of the Bears-Packers game if that team also won in Week 16. If that’s not true and everybody finishes 1-1 over the final weeks, the Lions still win. If Detroit wins and then goes 0-2, just give Seattle a bye to the Super Bowl. This will be a lot clearer, I promise, after Monday night. The Eagles could clinch the NFC East next week with a Philly win and a Dallas loss, but that would be way too simple. As long as that doesn’t happen, these two teams will decide the NFC East in Dallas in Week 17. Arizona fended off Tennessee’s comeback to win in overtime and go to 9-5, which keeps its playoff hopes alive. It needs a lot of help in just about every permutation to make the playoffs, but its easiest path to making the playoffs is by beating the 49ers in Week 17 and having the Panthers lose their final two games. I think. Of course, you can play all these probabilities out with the ESPN Playoff Machine. Atlanta-Washington, somehow, was one of my favorite games of the year to watch. You can have your boring Seattle–San Francisco puntfest. Enjoy your Baltimore-Pittsburgh shoving matches. I don’t care. Having a 3-10 record doesn’t mean you’re ugly to me. This was a wildly entertaining, often hilariously bad contest between two teams that looked like they were among the five or six best teams in the NFL this time last year. I must express my love in GIF form. First, there was the battle of the irresistible force versus the irreducible objects. Steven Jackson has perfected his Michael Turner impression to the point where he doesn’t even seem to concern himself with the possibility of making guys miss anymore, but Washington’s defense is full of guys who make it their business to miss tackles in impossibly creative ways. What will happen when these two seemingly warring worlds collide? That’s Washington defensive back Josh Wilson getting absolutely trucked by Jackson at the goal line for a rare highlight from the Atlanta running game. I can’t pretend that I would want to be in Wilson’s shoes with Jackson bearing down on me in that moment, but I also don’t know that trying to back body drop Jackson out of the end zone for a touchback was the right move. Washington quarterback Kirk Cousins made his 2013 debut as a starter in this game and showed some flashes of very solid play. He exhibited above-average arm strength in zipping a number of throws over the middle of the field to Pierre Garcon & Co., but he did struggle with turnovers, his past bugaboo. Cousins threw two picks and was strip-sacked once, and he had at least two other passes nearly intercepted. Given that he was playing the league’s second-worst pass defense, it wasn’t exactly an awe-inspiring performance. And what does the league’s second-worst pass defense look like, exactly? It looks like rookie seventh-round safety Zeke Motta. Motta, coming over to aid the badly torched Desmond Trufant (who committed illegal contact) on Garcon’s double move, somehow misjudges the flight of the ball so badly that his dive to make a play on the football sees him land behind the trailing Trufant. A really good safety picks that pass off. An experienced safety tracks the ball well enough that he can try to make a play on the football while preventing Garcon from getting behind him. Motta careens onto the screen and isn’t within three yards of the football. Rookies! That play came shortly after the two teams traded fumbles on three consecutive plays. No, really. After Cousins completed a pass to Aldrick Robinson for 62 yards, star Washington left tackle Trent Williams hobbled off. The team replaced him with 2012 sixth-rounder Tom Compton, and on the very next play, the team ran a sweep to the left side behind Compton, only for his man to push Compton into Alfred Morris, knocking the ball out of Morris’s hands. On the very next snap, rookie free-agent tackle Ryan Schraeder was badly beaten one-on-one by Ryan Kerrigan, who strip-sacked Matt Ryan. Then, apparently sick of rookies making mistakes, 87-year-old receiver Santana Moss caught a pass on the very next snap and fumbled the ball away to the Falcons, who were so excited that they committed two unnecessary roughness penalties after the play was over. That’s an underthrown shovel pass! I’ve never seen that before. It’s incredible. You want to say that it just slipped out of Ryan’s hands and that he probably didn’t mean to throw it? Believe what you want, but the league ruled it an incomplete pass, which means that it was an underthrown shovel pass. You know what? Just turn that new Falcons stadium into another new stadium for the Braves. Just in case they need a backup new stadium. Underthrowing a screen pass makes that all worth it. 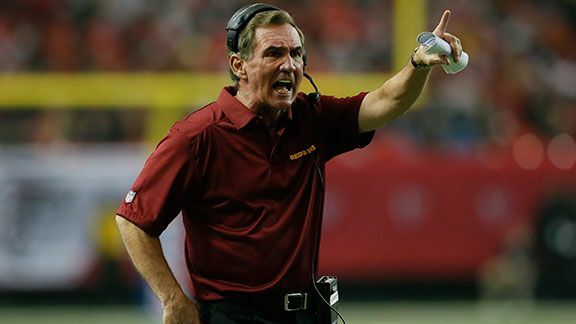 Mike Shanahan, perhaps answering the pleas of the D.C. media to get to the postgame press conference as quickly as possible, saw his team score a touchdown to go down 27-26 with 22 seconds left. He then chose to try to win the game with a two-point conversion as opposed to tying up the game for overtime. He left the ball in Cousins’s hands, and while Cousins was able to elude pressure and get out of the pocket, his pass to Garcon was tipped away by Trufant to seal a win for the Falcons. The play didn’t work, but was going for two the right call? Absolutely. You have to figure out whether your odds of winning in overtime are better than your odds of converting a two-point conversion, and the latter seems clearly higher. Washington was a six-point underdog playing on the road in Atlanta, which should tell you that it wouldn’t be favored to win heading into the overtime coin toss. The increased importance of special teams in overtime also wouldn’t bode well for Washington’s chances. It would probably be fair to estimate Washington’s chances of winning in overtime at about 40 percent. Its chances of converting a two-pointer have to be higher. Washington’s strength as a team is on offense with its running game and its big receivers, notably Garcon and (on this day) Fred Davis. Washington has been one of the best power-running teams in football this year. All that matters in a two-point conversion. There’s no reason to think Cousins couldn’t handle the pressure of a two-point conversion; remember, last year, he ran in a quarterback draw to tie the game against Baltimore just before overtime. We never know each team’s “true” ability to convert two-pointers because the samples are so small, but given its nature across the rest of the field, Washington is likely an above-average team on two-point conversions. Its chances of converting were probably at or above 50 percent. Exact probabilities are unrealistic here given the small sample and the specific nature of these teams, but going for it makes sense to me. A similar situation erupted in Tennessee at the end of regulation as part of its stunning comeback against Arizona, but more on that tomorrow in the full-size TYFNC. 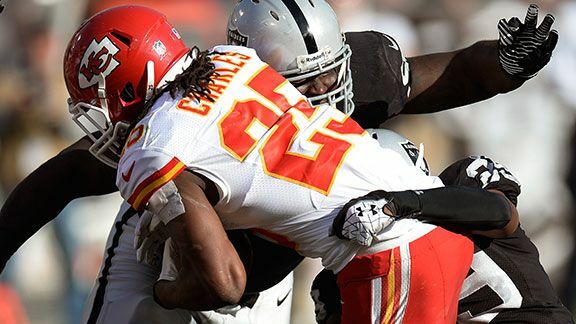 It’s good that you probably weren’t watching the Chiefs-Raiders game Sunday afternoon, because the things that Jamaal Charles was doing to the Raiders shouldn’t have been broadcast on television before the safe harbor. With the Oakland defense either unaware that running backs can catch passes or uninterested in learning from its mistakes, Charles caught a bevy of screens and swing passes amid a truly monstrous day. While Charles only ran for 20 yards on eight carries — by far his lowest rushing output of the season — his eight catches yielded a whopping 195 yards, tying him with DeSean Jackson as the day’s leading receiver. In all, Charles finished with five touchdowns, four of which came through the air. In a traditional scoring system, Charles produced 51.5 fantasy points. Of course, fantasy points are even more meaningful these days. Charles’s huge day came in Week 15, which is right smack-dab in the middle of just about every fantasy football league’s playoffs. I suppose there are some people who had Charles in their lineup this week and lost, but I’m guessing that the 50-spot Charles posted won a lot of people a lot of playoff games and a whole lot of money. Given the high stakes, was it the most clutch fantasy football performance … ever? Football crack — also known as pro-football-reference.com — has game logs for individual players dating back through 1960. For the purposes of this analysis, let’s just assume nobody was playing fantasy football before 1960.4 The website also tracks the fantasy football points generated by each offensive player from those game logs. The figures don’t include fumbles, but Charles didn’t fumble on Sunday, so that won’t matter in comparing him with the greats from the past. I want to compare Charles’s performance to other great playoff performances from the past, but just about every league I’ve ever seen has different playoff rules, so let’s keep things simple and just consider performances that occurred between Week 14 and Week 16. As it turns out, Charles’s game against the Raiders on Sunday was the third-best performance during the fantasy football playoffs over the past 53 years. He came in one-tenth of a point behind a Corey Dillon game from 1997. The record belongs to Clinton Portis, who generated 55.4 fantasy points during a 2003 Broncos game that saw him score five touchdowns while producing 254 yards from scrimmage. Three of the top 10 performances in fantasy playoff history came from running backs under Mike Shanahan in Denver, which should be part of Shanahan’s Hall of Fame argument someday. Charles is the first guy over 40 points in a fantasy playoff game since Jerome Harrison’s 286-yard game against the Chiefs in 2009. Charles was pretty good in Week 14, too: He produced 27.8 fantasy points with two touchdowns and 158 yards from scrimmage in the blowout win over Washington. The Colts and their 25th-ranked run defense loom in Week 16. With 79.3 fantasy points under his belt through the first two weeks of the playoffs, could Charles be on pace to be the most valuable player in fantasy football playoff history? Absolutely. The best three-week performance from Week 14 to Week 16 since 1960 belongs to Charles’s predecessor as the Kansas City starting halfback. Larry Johnson produced 95.4 fantasy points over that three-week stretch during the 2005 season, accruing a total of 441 rushing yards, 93 receiving yards, and seven touchdowns. For fun, he threw in a 222-yard, three-touchdown performance in Week 17 for leagues that abhor the light. Charles already has the third-best performance in fantasy playoff history. To top Johnson’s 2005 and set a new playoff record, Charles will need to generate 16.2 fantasy points. A touchdown and more than 100 yards from scrimmage would get the job done. Back here in real football, though, the Chiefs need to seriously start thinking about how they want to manage Charles’s workload heading into the playoffs. As amazing as his performance on Sunday was, the Chiefs were right to keep him out toward the end of the game to get backup Knile Davis touches while attempting to keep Charles fresh for the playoffs. He’ll obviously suit up next week, but if the Chiefs lose to the Colts and get locked into the fifth seed in the AFC with a Broncos win, Andy Reid should absolutely bench his star halfback in Week 17 in what would be a meaningless game (for the Chiefs, at least) at San Diego. Charles is more essential to his offense, arguably, than any other non-quarterback in football; it’s impossible to imagine the Chiefs going far in the playoffs without him around, so it will be critical for Kansas City to get him as fresh as possible. The Chiefs would like to see the Charles who won so many fantasy football playoff games yesterday help them win an NFL playoff game or two this season. 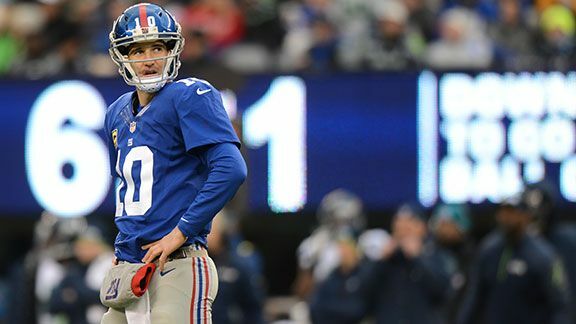 Eli Manning threw five interceptions on Sunday. Yes, he was playing the Seahawks, who have the best pass defense in football by a considerable margin. Sure, one of the interceptions came on a Hail Mary, and for some reason we still figure picks on Hail Mary attempts to be as meaningful in terms of interceptions as any other normal throw. That shouldn’t be. It doesn’t matter. Ignore the Hail Mary and Manning still threw four interceptions in 30 pass attempts. As it were, this will go down as the first five-interception game in Manning’s career. So, I’m going to throw this out there, but I don’t feel very good about throwing it. Do we need to have the talk about Eli? You know, that talk? You would be hard-pressed to make a case that Manning is delivering above-average play this year. Those five interceptions bumped Manning all the way to 25 this year, which leaves him four ahead of rookie Jets starter Geno Smith. Nobody who plays their home games outside of the Meadowlands has thrown more than 17 interceptions this season. The best quarterback in New York might be Charlie Ward all over again. Manning has always been a quarterback who throws his fair share of interceptions — he’s already 43rd on the list for most interceptions in league history, and he’s about to lead the league in picks for the third time as a pro — but this is a particularly brutal season, even for him. If Manning were just throwing a ton of picks and otherwise playing well, you could forgive him a bit of bad luck and some playmakeritis. That’s just not the case. In fact, many of Manning’s numbers are trending downward and have been for some time. His completion percentage peaked in 2010 at 62.9 percent; it has now dropped for three consecutive years and fallen all the way to 58.6 percent. Manning’s passer rating is down all the way to 69.7, his lowest figure since his awful rookie half-season. He has a lower passer rating than the likes of Matt Schaub and Brandon Weeden. Manning was even 34th in QBR at 36.0, behind the recently benched Robert Griffin, and that figure was before this five-interception game even happened. To be fair to Manning, the team around him has basically collapsed. Hakeem Nicks has sleepwalked through a miserable campaign, and Victor Cruz has gone missing for weeks at a time. GM Jerry Reese’s wheel-of–tight ends finally landed on a disappointment, as Brandon Myers has failed to live up to the likes of Martellus Bennett and Jake Ballard. Most notably, Manning’s offensive line has been in shambles. Exactly one lineman — left tackle William Beatty — is active and starting in the same spot he was supposed to man when the Giants were planning this thing out in August. That’s not a good thing, either; Beatty has been a mess, having allowed nine sacks even before Sunday’s loss. The only offensive player who has lived up to expectations is … oh god, it’s Curtis Painter, who is now 6-for-8 on the year with a pick. Why is this happening and can it stop soon? It actually might, because Reese is about to enter a very awkward negotiation period with his superst— oh, just his quarterback. The Giants are in the latter stages of Manning’s seven-year contract extension, meaning that most of his signing bonus has already been charged to New York’s cap. There are two years to go on Manning’s current deal after the 2013 campaign, and they’ll be expensive. In 2014, Manning will take up $20.9 million of the Giants’ cap, or about 16.5 percent of the projected $126.3 million ceiling all by himself. That figure falls slightly to $19.8 million in 2015, after which Manning would become an unrestricted free agent. Because that signing bonus has been mostly covered by now, getting rid of Manning wouldn’t be cost-prohibitive. In fact, it would save the Giants a lot of money. The Giants would save $13.4 million on their cap in 2014 by trading or releasing Manning, a figure that would rise to $17.5 million in 2015. They wouldn’t have a quarterback, of course, but that hasn’t really been much of a help this year, anyway. The flip side of that argument is even scarier, since the Giants will likely have to endure the hometown premium in offering Manning a new contract. He already has the largest cap hold of any player in football at $20.9 million this year, coming in $3 million ahead of second-place Matthew Stafford. The last guy around Manning’s age to get a contract at quarterback was Romo, and he got seven years and $120 million with $40 million guaranteed to re-up with the Cowboys. Romo’s cap hit next year is the one that will lead the league unless it’s renegotiated, but it’s currently at $21.8 million. Can you really give a guy playing the way Manning is right now a raise? Do you really want to give a five- or seven-year contract to a quarterback who will be 33 next season? It seems impossible to imagine the Giants moving on from their star quarterback, but that day of reckoning is coming soon. Reese will either need to commit to Manning on a new long-term deal or make a move to replace Manning with the team’s quarterback of the future, since that guy clearly isn’t on the roster. And if Reese is ever going to make that move, 2014 would sure make a lot of sense as the right time to do it, given that the Giants will have a relatively high pick in a deep quarterback class. Alternately, the Giants could use Manning’s poor 2013 as leverage in negotiating a new deal at a relative valley in Manning’s value, saving themselves millions in the process. With more five-interception games, even the Giants would have to wonder whether Eli’s worth the money. I suspect that the Giants will give Manning 2014 to right the ship, but if it’s another season of decline with an interception per game, it might very well be the end of Manning’s tenure in New York. Halftime leads of 23 points are relatively rare; there have only been 40 games with such a lead since the merger in 1970. Teams with such a lead at halftime were 38-1 before yesterday. Alternate reading: Tony Romo is only really great in November. November is the 11th month of the year. Eleven is a prime number. Is Romo part of the Illuminati??? Are his poor performances in key games designed to throw us off the trail? If he signs to Roc Nation Sports or the NFL starts playing meaningful games in July, we’ll know. I see all of one: In 2012, Romo tied a game in the fourth quarter with a touchdown drive and the defense picked off Ben Roethlisberger on the first drive of overtime to set up a game-winning field goal. That’s the only one I can find. OK, and maybe they weren’t playing it for a couple of decades afterward, but it would have been interesting at the time. How would people have handled the arrival of the AFL? Would you really want to put the time in to play in an NFL fantasy league and an AFL fantasy league? Would you mix players from both leagues, even though scoring levels between the leagues were different? Did people have this problem with the XFL? Did you play in an XFL fantasy league? Would you tell any of the people you love that you did that?